Founded in 1882 in Bologna, Italy by Luigi Bertagni and his two brothers, Bertagni is the oldest filled pasta producer in Italy. They began with tortellini and now along with a variety of tortellini, they produce fresh pasta, ravioli and girasoli that are sold in 45 countries on 5 continents. Apparently the Bertagni brothers were also innovators in preserving and packaging pasta for sale in grocers. In early 2018 the company was bought by the Spanish food conglomerate Ebro Foods. 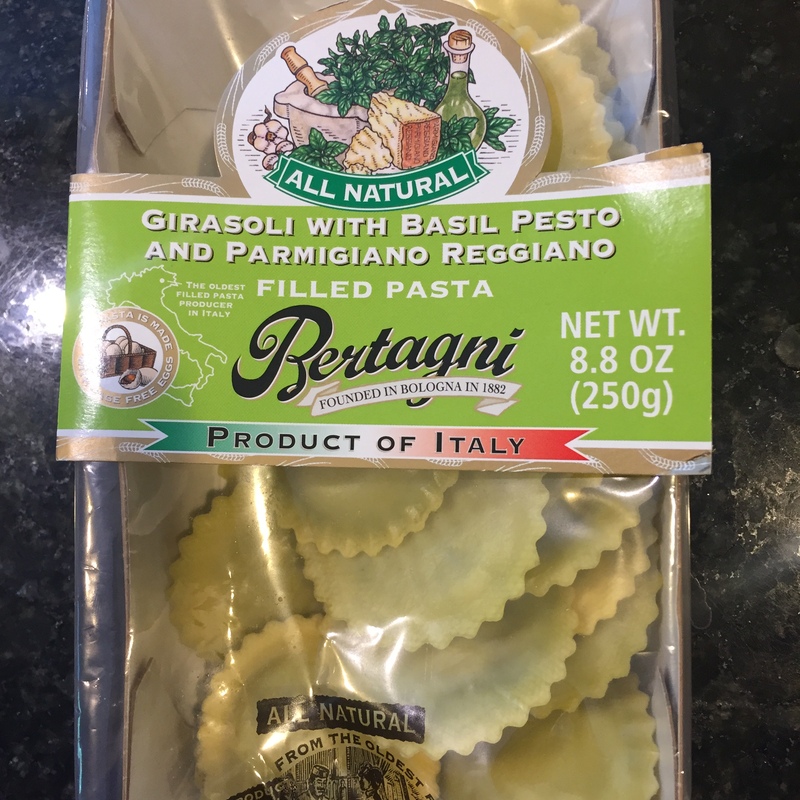 Bertagni’s Girasoli with Basil Pesto and Parmigiano Reggiano caught my eye at Whole Foods. Girasoli are a type of fresh filled pasta, similar to ravioli, but made in a round sunflower shape. These Girasoli were excellent, I could distinctly taste both the Basil Pesto and the Parmigiano’s sharp, savory, nutty flavor. I ate the Girasoli with a robustly flavored red sauce and some cheese, but this pasta can shine by itself and could be served with just some butter and olive oil and a little garlic. This pasta is pretty delicate and easy to over cook, so use a low boil for only 3 of the 3-4 minutes recommended on the packaging. 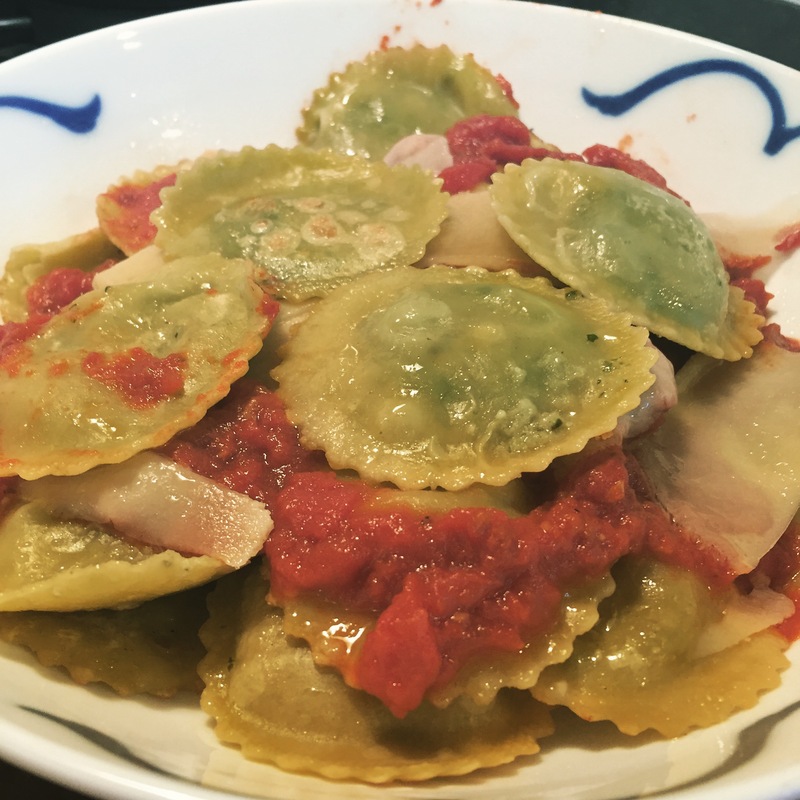 This entry was posted in Frozen Dumpling Review, Girasoli, Ravioli. Bookmark the permalink.